Time flies. At least from my perspective this year has raced past me. I always feel that the days, months, and year as a whole, moves a lot faster when you have a lot going on. It's almost as if it wants you to take everything over into the new year with you. However, that can't be the way to begin a new cycle, right? no New Year's Resolution can compete with the unexpected events that occur throughout the year to set our course of life on an entirely new path. It's New Years Eve! It's a time to reflect on how far we have come and to set the stage to begin anew tomorrow. No, I cannot sit here and write that everything will be simple and easy because what would life be if it handed us everything we wanted or thought we needed. New Year's Eve is a time to reflect and remember those who have passed on and gone to a better place. They have passed on to make us realize how important we are to each other no matter our race, religion, or economic status. We have seen and heard it all during the political race, then re-election of President Barack Obama, to the endless violence of gunfire on our own soil. We are stronger. We are wiser. Some of us have looked sickness in the eye and said that it will not claim us this year because there is more for us to do before we leave this place. Some of us have conquered fears that we ourselves thought would end us. We are one on this New Year's Eve, standing together in Time Square, on our living room couches in front of the television set, or overseas counting down the time to Begin Again. It's New Year's Eve. Let's get ready to begin again. With the rush of the New Year in the air, Selena Thinking Out Loud With Purpose is happy to bring you this iPad or Microsoft Surface Tablet Giveaway Event! We are just one day away from New Year's Eve and what great news it would be to win your very own iPad or Surface just in time to start your "new year" journey. I am loving this and I'm bringing this giveaway to you with special thanks to our hosts below. Technology is changing everyday and I want you to have the opportunity, in this New Year, to add-to or start joining in on all the fun. It is definitely an adventure and there are many new worlds to discover and things to learn using technology. So...make sure your entries are counted by using the Giveaway tool entry form below. Good Luck, Everyone! Giveaway runs: December 30, 2012 at 12:01AM/EST through January 20, 2013 at 11:59pm EST. Open Worldwide. (If winner is outside the US, he/she will receive the cash equivalent, no exceptions. US winner may also opt for cash equivalent. 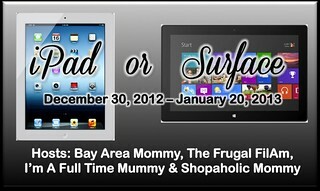 Bay Area Mommy, The Frugal FilAm, I'm A Full Time Mummy and Shopaholic Mommy! 16GB iPad with retina display ($499) OR 32GB Microsoft Surface Tablet ($499)!!! Already have a tablet? That's Okay! You can opt for the cash equivalent via Paypal! Disclaimer: Selena Thinking Out Loud With Purpose is not responsible for prize fulfillment. For any questions regarding this giveaway, please contact Bay Area Mommy. In the industry of “show business” you have to have some sense of style. Personally, I am all about being myself and enjoying the skin I'm in. Before, I was a lot more conservative and corporate with my style but then the “color bug” bit me when I moved to Los Angeles, CA and brought with it a lot more options. I find myself enjoying the vintage stores and thrift shops, when looking for out-of-the-box looks. They have the most unique-looking blouses, pants and shoes too! However, at times, I do have to go along with the First Lady's sense of style with an 'everyday woman' look. Now, that I have added color, I find that like a good lipstick or eye shadow, incorporating a colorful pair of tights or leggings into my outfits give me a lot more edginess and I feel inspired to take chances! Recently, I was fortunate to receive one pair of No nonsense tights and leggings to try with two outfits. In this first pic below, I really liked this red and gold top by designer BlingBling and decided to match it up with the Expresso-colored leggings from No nonsense. What I really loved most about the leggings was how well they fit. I have a slender body and like my jeans or slacks to fit properly. The leggings were not only warm and comfortable on my skin, but the size 'Small' fit like a glove. This is such an ironic thing because I just started experimenting with leggings this season, after a boutique designer told me to try leggings with my tops instead of skinny jeans. Now, I have No nonsense to thank for the Expresso-colored leggings and comfortable wear and support to keep me buying more. In the second pics below, I bought this black dress with a beautiful, multi-colored pattern, down the center by designers Emma & Michele. The No nonsense Black, patterned tights with control top really gave the outfit a more wintery look and feel. I may not live in my hometown of Washington, DC anymore, but the nights in Los Angeles can get cool and these tights really kept my legs warm but looking fabulous at the same time. I really liked the pattern of these tights because they were not only black but had something else to offer the dress, which had it's own unique colorful design. When some people think of tights they think of little girls with Sunday dresses and how itchy they can be. After wearing them myself, they were comfortable, not itchy, and in my correct size of Small/Medium. Also, I usually don't buy stockings or tights with a control top because sometimes it can be a little too tight for my waist and stomach area, but these were comfortably-positioned around my waist and I could feel the support. I have my own history of buying No nonsense Off-Black stockings in my local supermarket or drug store, like CVS. They are priced reasonably well and that's a big deal when shopping. It's nothing wrong with saving money when you can. I enjoy an affordable deal that's easily accessible. If you're in a fashion emergency and need leggings or tights to jazz up your outfit, then stop by your local pharmacy or supermarket, either of the two, to get you some. No nonsense is doing great things for their brand. They have teamed up with Fashion Expert, Jill Martin, who is seen by millions of women and trusted for her last-minute, “fashion crisis” expertise. She is also an Emmy Award-winning TV personality and co-author of the New York Times bestselling style guide “I Have Nothing to Wear!” If you watch Access Hollywood, then you have seen Jill as the New York Correspondent. She will be working with No nonsense on a series of online vignettes to show us ladies how to wear the hot, new line of No nonsense colored tights and essential leggings to jazz up our already fabulous wardrobes. Like myself, Jill Martin, has always been a fan of No nonsense because of how easy they are to wear and find. Go Jill! With the buzz going on about the new No nonsense colored tights and essential leggings that I had the opportunity to wear for myself, I decided to add them to my social network of brands to keep in touch. If you're on Facebook, Like No nonsense on Facebook and Follow No nonsense on Twitter. Personally, I'm looking forward to seeing the online vignettes by Jill Martin and seeing what other colors I can work into my sense of style. Have Fun Ladies! #MerryChristmas 2012 and Thank You! From: Selena B. Today is Christmas Day and I am hoping that you are spending time with the one you love and the family and friends and little ones in your life. This year has been something, hasn't it? However, that's how it is when you're working hard towards reaching your goals. Today is a very special day on a spiritual plain since He is the only reason for my continual health and strength. It's His B-Day and the time for us all to give love and to remind others in our lives how important they are. Life is short, but life is full of beautiful places, space, and opportunities to meet and occupy moments with others. For those readers who stop by Selena Thinking Out Loud With Purpose to see what's going on with all the fantastic giveaways or to read my unexpected personal blog posts, product reviews, and little somethings, I thank you for the support. I really enjoy collaborating with other simply amazing bloggers to bring you great giveaways. It makes me feel good to contact the winners of my giveaways and read the excitement and joy in their email responses. You are truly appreciated by me. Today is Christmas Day...it's time to relax this one day with those who give you joy and make life for this one day seem okay. Enjoy the big feast, football and basketball, going to the movie theater, or just being at home by yourself with your cats and dogs with a cup of hot chocolate and a stack of movies because in the end, you are loved and appreciated. Selena Thinking Out Loud With Purpose is excited to share this special launch of Wax Roses by Jewelry Candles! Every dozen has jewelry inside while smelling fabulous at the same time. What a delightful gift to win for the New Year! The host, Elitemama, has provided great details about this Wax Roses Giveaway and the Rafflecopter Form below. Good Luck! Every woman loves the smell and look of roses. Something about them makes a woman's heart melt. Wax Roses were invented by the one and only Jewelry Candles. What inspired Jewelry Candles to come up with this amazing product is their love for flowers and jewelry. Wax Roses are made of wood and they last a pretty long time. They are triple dipped in wax to ensure you an amazing smell for a long time! Each set can last about 6 months to a year. The only thing that you would have to do with the roses each month is heat them gently with a hair dryer for the aroma to fill the air. Each set comes in 6 different colors; lavender, white, red, pink, light blue and yellow. Each set (1 dozen roses) come in an elegant box and the roses come with a bow wrapped around the stems. There is also a special surprise with ever set of roses! Each set of roses contains a hidden jewel. Just like the candles, but with roses instead! Jewelry in the roses are worth anywhere from $10 to $7,500. These lovely Wax Roses ($39.95 + $5.00 sh&h) can be purchased January 15th, 2013 or even sooner. Just in time for Valentines day! One lucky winner will be receiving a set (1 dozen) of yellow wax roses. You must be 18 years or older to enter. Giveaway is open to the US and will end January 5th. Enter the rafflecopter form below. Disclaimer: Selena Thinking Out Loud With Purpose is not responsible for the delivery of prize. The host will contact the winner for mailing arrangement. No compensation was given in the promotion of this event. Selena Thinking Out Loud With Purpose really enjoyed promoting the last Have it Your Way $200 Giveaway, so I thought, why not participate again for my readers! This time, this giveaway will end in January, which we all know how important getting ourselves back on track and reorganizing things are. So... to help you get yourself reacquainted with your financial goals, maybe help start a new endeavor or get something that may help move an idea along, why not enter this $200 Have it YOUR Way Giveaway! The sponsors are all listed below and there is the Rafflecopter form for you to enter this giveaway there as well. Good Luck and Have Fun! Welcome to the Monthly Bloggy Have It Your Way $200 Giveaway! Giveaway Runs: Dec. 20 at 12:00am EST thru Jan 21 at 12:00am EST. Pink Ninja Media, Jenn's Blah Blah Blog, and Happy Home and Family! One (1) lucky person will win anything they want valued up to $200. IMPORTANT: If the item you choose requires us to pay shipping, the total cost of item and shipping cannot be over $200. Please use the Rafflecopter Entry Form provided below to submit all entries. Thank you! Disclaimer: Selena Thinking Out Loud With Purpose is not responsible for shipping prize to winner, nor did we accept any compensation for helping promote this event. All opinions are 100% my own based on my own experiences. Pink Ninja Media, Jenn's Blah Blah Blog, and Happy Home and Family bring you a great FREE blogger opportunity and Selena Thinking Out Loud With Purpose would like for you to join in too! Are you into nice comfortable sheets and how they are made and stitched? Well, this is the opportunity for your readers and YOU too! Not only will your readers have the chance to win, but YOU can enter when it goes LIVE! Offer your readers a chance to win a Luxurious Bamboo Sheet Set value up to $299! Winner of giveaway will choose sheet size, king sized sheet set is valued at $299. Needless to say these sheets are awesome. These sheets are valued up to $299 and worth every last cent! Winner will receive one complete set of these fabulous sheets, valued up to $299 depending on size needed. FREE Facebook Link with announcement post. Pink Ninja Media, Jenn's Blah Blah Blog and Happy Home and Family and Selena Thinking Out Loud With Purpose would like for all you AMAZING Bloggers to join in this FREE Blogger Opportunity. Get a FREE Facebook link and FREE Twitter link! #WinnerAnnounced for $30 Amazon Gift Card or PayPal Cash in Winner Wonderland Giveaway Hop at Selena Thinking Out Loud With Purpose! Selena Thinking Out Loud With Purpose is happy to announce the WINNER of the $30 Amazon Gift Card OR PayPal Cash in this Winner Wonderland Giveaway Hop! Thank you to all who participated. Randomly Drawn Entry #73 - Geoff K.
IMPORTANT: The winner will have 48 Hours to respond to email sent by Selena Thinking Out Loud With Purpose to claim prize. After this time, another winner will be randomly drawn using Random.org. Day Twelve prizes for the 12 Days of Christmas Giveaways have been posted below on Selena Thinking Out Loud With Purpose! These prizes are all around GREAT with a value of over $500, depending upon which bag and bracelet you choose)! If you're just learning about this event, every day for the past 12 days, which began 12/1/12, 12:00Midnight/EST, I have posted a new LIVE giveaway on my blog for this event! 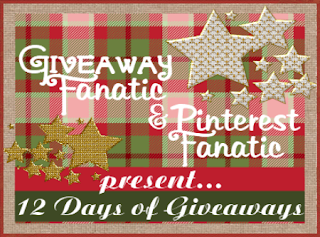 The days have now reached Day Twelve for the 12 Days of Christmas Giveaways! Enter on the Rafflecopter form provided for that particular giveaway! The Cutey Prize can be awarded Worldwide. Fairy Tales Hair Care, Barefoot Venus Prize can be awarded to U.S. and Canada. The remaining prizes can be awarded to U.S. Residents only. Disclosure: Selena Thinking Out Loud With Purpose is not responsible for the distribution of prizes in this event. 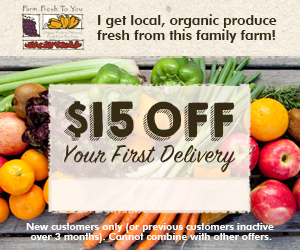 The host will contact each winner for delivery information. No compensation was received to promote this giveaway event. Day Eleven prizes for the 12 Days of Christmas Giveaways have been posted below on Selena Thinking Out Loud With Purpose! These prizes are for keeping your personal belongings safe in one place which includes your money too ;) If you're just learning about this event, every day for the past 12 days, which began 12/1/12, 12:00Midnight/EST, I have been posting a new LIVE giveaway on my blog for this event! The days have gone by so fast and Day Twelve will have extra prizes, announced tonight by the lead host of the 12 Days of Christmas Giveaways! Make sure to check back everyday 12/1, 12/2 , 12/3, 12/4, 12/5, 12/6, 12/7, 12/8, 12/9, 12/10, 12/11 (TODAY), and 12/12, for the new prize and to enter on the Rafflecopter form provided for that particular giveaway! This Giveaway is for Three (3) Winners Open to US. NOTE: The Ecojot prize is for US and CANADA! One (1) Winner will receive a $20 Gift Card from Ecojot. One (1) Winner will receive EatSmart Precision Voyager Digital Luggage Scale w/ 110 lb. Capacity & SmartGrip. 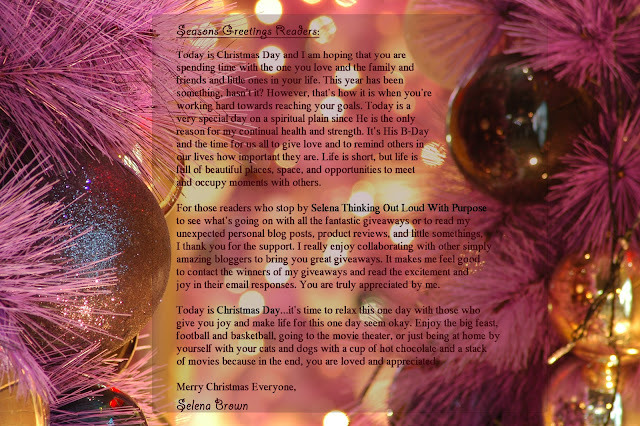 Day Ten prizes for the 12 Days of Christmas Giveaways have been posted below on Selena Thinking Out Loud With Purpose! These prizes are more in the beauty and fashion category for the ladies who enjoy make up and purses. If you're just learning about this event, every day for the next 12 days, which began 12/1/12, 12:00Midnight/EST, I will be posting a new LIVE giveaway on my blog for this event! The days have gone by so fast already and we're almost through the 12 Days of Christmas Giveaways! Make sure to check back everyday 12/1, 12/2 , 12/3, 12/4, 12/5, 12/6, 12/7, 12/8, 12/9, 12/10 (TODAY), 12/11, and 12/12, for the new prize and to enter on the Rafflecopter form provided for that particular giveaway! This Giveaway is for Three (3) Winners Open to US. One (1) Winner will receive a handmade tote in the "Picadilly Lane" fabric pictured below and with an inspirational quote sewn inside from Mama Mahoney Creations Inspiration Tote. One (1) Winner will receive a Tata Harper Skin Care Deluxe Beauty Gift Set. 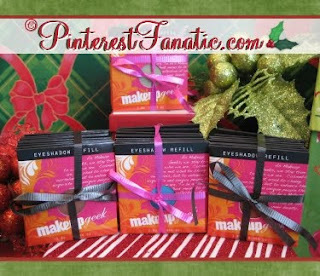 One (1) Winner will receive an eyebrow prize pack from Makeup Geek. 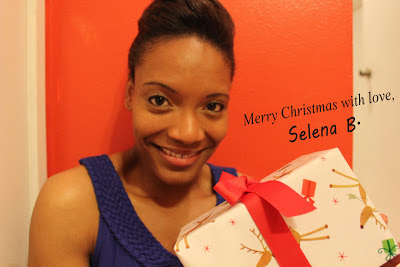 Winner Announced for $30 PayPal Cash #Giveaway in 2012 #Holiday Turkey Hunt at Selena Thinking Out Loud With Purpose! 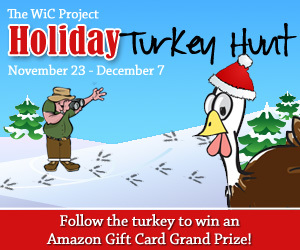 Selena Thinking Out Loud With Purpose is happy to announce the WINNER of the $30 PayPal Cash in this 2012 Holiday Turkey Hunt! Thank you to all who participated. (72) Entry #215 - RAYNA M.
Selena Thinking Out Loud With Purpose is SO excited to bring you this Netflix, LG, Popcornnopolis GIVEAWAY! Since getting my own Netflix subscription, I can't get enough of it. I watch movies and television shows on the go wherever I am. I am a HUGE movie fan and Netflix makes it easy for me to stay entertained. Mom Blog Society and many other amazing bloggers is sponsoring this three piece package giveaway for you. I am happy to be one of it's promoter to bring it to my readers and guests who stop by. Read all about the prize specifications below and submit all entries on the Rafflecopter Entry Form provided below. Happy Holidays and Good Luck! With more than 30 million streaming members in the United States, Canada, Latin America, the United Kingdom, Ireland and the Nordics, Netflix, Inc. (NASDAQ: NFLX) is the world’s leading internet subscription service for enjoying movies and TV programs. For one low monthly price, Netflix members can instantly watch movies and TV programs streamed over the internet to PCs, Macs and TVs. Among the large and expanding base of devices streaming from Netflix are the Microsoft Xbox 360, Nintendo Wii and Sony PS3 consoles; an array of Blu-ray disc players, internet-connected TVs, home theatre systems, digital video recorders and internet video players; Apple iPhone, iPad and iPod touch, as well as Apple TV and Google TV. In all, over 800 devices that stream from Netflix are available. For additional information, visit www.Netflix.com. Follow Netflix on Facebook and Twitter. Let your TV do the adjustments for you. Intelligent Sensor automatically optimizes the picture to the lighting and color conditions in the room for a more enjoyable viewing experience. Six regular-sized of our most incredible gourmet flavors jostle for position, nearly bursting out of their cones in their eagerness to overwhelm those unsuspecting taste buds. Creamy Our wildly popular Zebra® Chocolate, Luscious Pecan Caramel, Classic Caramel Corn, Cheddar Cheese, Kettle Corn and Cinnamon Bun. One lucky winner will be selected to win all three prizes. Simply enter via the Rafflecopter below for your chance to win. This giveaway is open to US residents only. 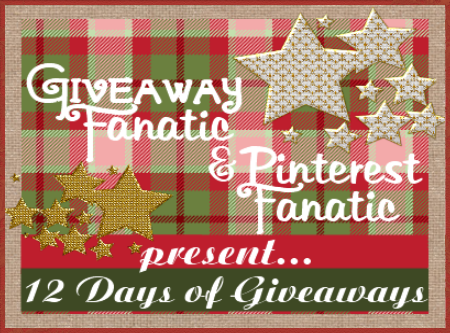 This giveaway ends on December 17, 2012 at 12:59 pm EST.